Today we’re covering a fun topic that we’ve touched on somewhat before: Surrealism! Surrealism is an artistic and cultural movement that originated in Paris in the 1920’s, and established a genre that artists are still exploring today. The art historical movements of the early twentieth century are truly fascinating, but as this is just a blog post, I’ll do my best to give a brief explanation of Surrealism’s nascence. Following the first World War, an especially brutal experience for many countries around the world, a generation of both civilians and former soldiers were left disillusioned and emotionally scarred. Reality, which art had for so long sought after so desperately, was suddenly quite painful, and the opportunity to step back from that and explore a different, more internal world appealed to many creatives during this time. The field of psychology was also rapidly growing, and the theories of famous psychologists like Sigmund Freud, such as notions of the subconscious mind and dream analysis, were becoming widely known. Several French artists and writers were inspired by the idea that the subconscious contained answers to fix the broken world around them, and that representation of these ideas, so different from reality, could jar society out of some of the long-held beliefs and structures that had led to such damage. Therefore, these writers and artists began to create bizarre, illogical scenes that evoked aspects of dreams and un-reality and elements such as odd juxtaposition, strange changes of scale, and elements of pure fantasy. 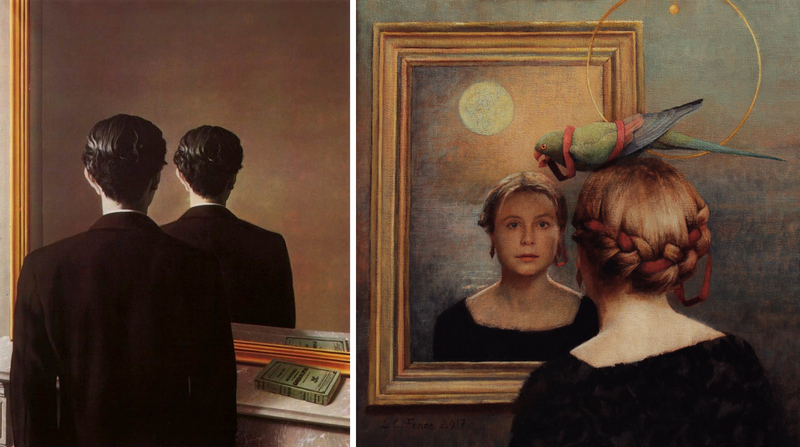 While some Surrealist painters, like Ernst and Dalí, created images that were more fantastical, some, like Rene Magritte, painted oddly familiar, ordinary looking scenes that had a major twist to them, and often an unsettling one. This is one of the aims of Surrealism–to get you to think differently! For instance, we know that a mirror reflects what is in front of it, but what if that reality was twisted a bit? Well, this is a concept that has inspired some Principle Gallery artists, too! Elements of Surrealism pop up in the work that we carry here at Principle Gallery, and it’s always a thrill to see the creativity these artists are expressing, as well as the reaction from the viewers. There are two artists who show primarily at our Charleston, South Carolina location who use elements of Surrealism quite often in their work– Karen Hollingsworth and Anna Wypych! Click any collage to see it larger! Check out these artists, and many more, on the website for Principle Gallery Charleston! Happy Tuesday! This week we are talking about a type of paint that doesn’t often get a lot of attention– gouache! Pronounced “gwosh,” this type of paint is an opaque, water-soluble medium that has some of the qualities of both watercolor and oil, and in the case of acrylic gouache, even acrylic! The name is a French word derived from “gouazz,” which is an old Italian term meaning “mud.” Although it was not referred to as “gouache” until the 18th century, gouache paints originated long ago, as a derivative of watercolors. In order to make watercolors more opaque and therefore easier to layer and use as a highlight, they were mixed with an opaque white pigment. Opaque watermedia is a very old medium, and can be seen in examples as early as 9th century Persian miniatures. (Later, Italian artists would attempt to achieve the same look by layering oil paints over tempera paints, giving it a matte (or “muddy”) finish.) In the 18th century, as it became more popular, French artists mainly used gouache to add highlights over their pastel work, but the use has expanded over time and many artists today paint entire artworks in gouache. It is a unique medium in that, though water-soluble like watercolors, it gives the artist an option to layer light colors over dark because of the matte opacity. An artist must use gouache very carefully to avoid a very flat and muddy effect, but those who have mastered the medium have created some incredible works with it! Modern gouache options now include acrylic gouache, which, because it is made with an acrylic-based binder, dries to a more water-resistant surface despite the water solubility of the wet medium. Let’s take a look at some examples of paintings either partially or fully created with gouache throughout history! 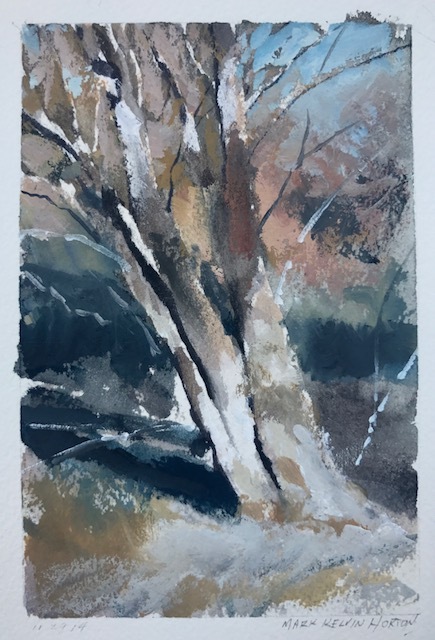 Gouache is not something we often get here at Principle Gallery, but just recently we’ve gotten a few pieces created with watermedia, including gouache! 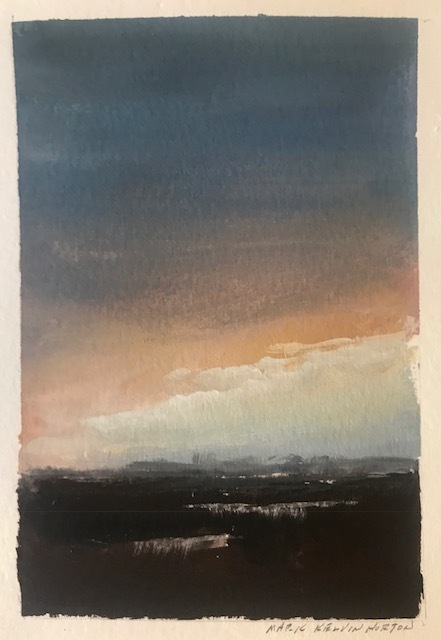 Here are a couple of examples from Mark Kelvin Horton, who recently sent us a great series of small landscapes on paper, in a variety of media. Here are two that use gouache! 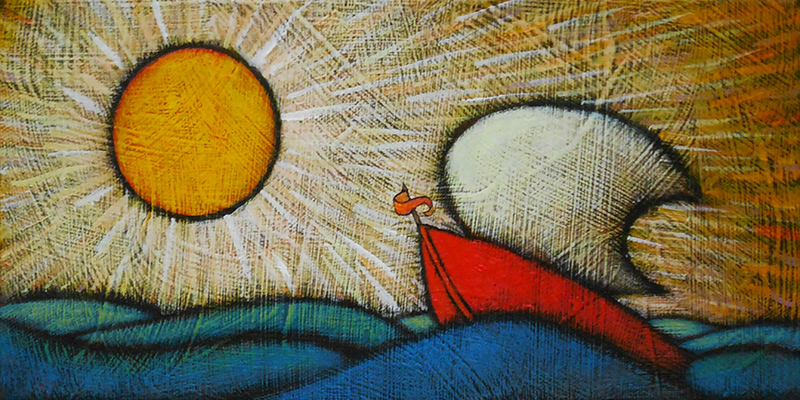 Ben Barker is another artist that we work with who enjoys the challenge of using gouache from time to time! Though all of the other artworks from Ben that we’ve shown so far have been in oil, here’s a very cool landscape of Rock Creek Park, painted in gouache! We are always getting in new works from our widely varied roster of artists, so be sure you’re on our e-mailing list if you’d like to get a first-peek at new art when it arrives! To be added to the mailing list, just shoot us an email at info@principlegallery.com! Thank you so much to everyone who joined us for the opening reception of the GC Myers solo exhibition “Truth and Belief” last evening! It was a wonderful turnout and we’ve had such an exciting amount of sales so far in the show. We love giving you all the chance to meet and chat with the incredibly talented artists that we represent, and the artists love it as well. Last night, as you can see up at the top left here, we even had a young budding artist present GC Myers with some of her own artwork inspired by his paintings! If you weren’t able to make it last night and you’d like to meet GC Myers, you’re in luck– he’ll be back in September for an artist talk, so be sure to follow our social media pages or join the mailing list to be reminded of the date! 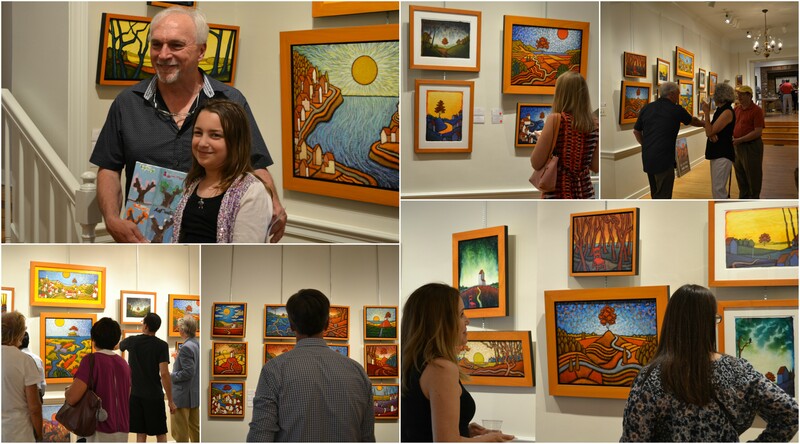 To see the images from the “Truth and Belief” show, check out our website here! Welcome back to Technique Tuesday! With the GC Myers “Truth and Belief” exhibition opening just a few days away, it’s the perfect time to take a look at stylization! Stylization is a technique that’s been around for a very, very long time. In 1979, The Great Soviet Dictionary provided an excellent definition of stylization, explaining it as “the decorative generalization of figures and objects by means of various conventional techniques, including the simplification of line, form, and relationships of space and color.” To look at it from a different perspective, stylization is a deliberate step away from mimesis, which is defined as the close mimicry of reality (in art, this is very generally referred to as “realism,” though that particular term has evolved and is rather nuanced). 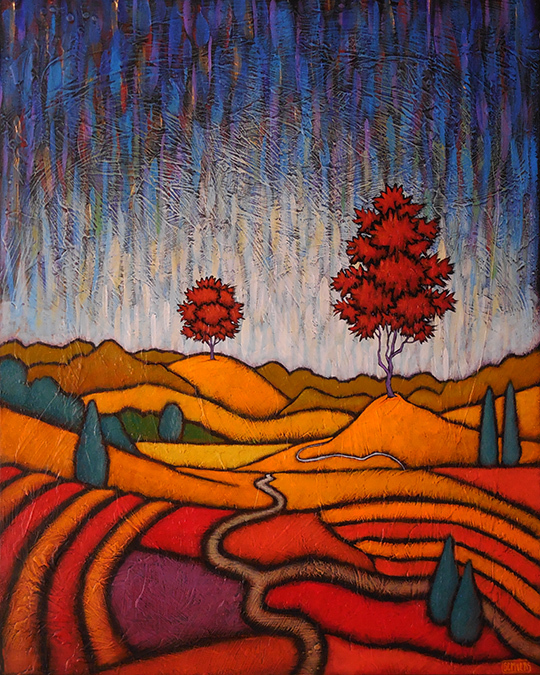 Rather than trying to represent the subject in a way that is close to reality, an artist can use stylization to create images that, while they contain recognizable subjects and forms, do so in a manner that places emphasis on the color, lines, and oftentimes the emotive qualities of the work. Stylization is something that can be seen as far back as ancient cave paintings, as recognizable subjects were visually portrayed in a simplified manner. Part of this no doubt had to do with the fact that humanity was discovering the visual arts and experienced a learning curve over time when it came to more accurate mimicry of reality in drawing, painting, and sculpture. As time progressed, the goal for many artists became increased mimesis, and stylization began to slowly give way to more realism in art. We can see from the height of the Renaissance through the 19th century that artists took a great joy in creating highly realistic images and exploring the very accurate representation of architecture, human anatomy, natural plant life, etc. As Impressionism broke from academic tradition in the 19th century and brought a focus back to experimentation with colors and light, and stepped back from strict mimesis, it spurred a renewed interest in deliberate stylization and in using the portrayal of recognizable subjects as a platform in which to also revel in color, line, and shapes. Because of its accessibility (one need not necessarily go to school for art or train for years to create stylized art) and its celebration of line and color, stylization is frequently seen in street art and graffiti-style art, as in the case of the late 20th century artist Keith Haring. While we carry almost solely representational art here at Principle Gallery, it does certainly vary across the spectrum of mimesis. 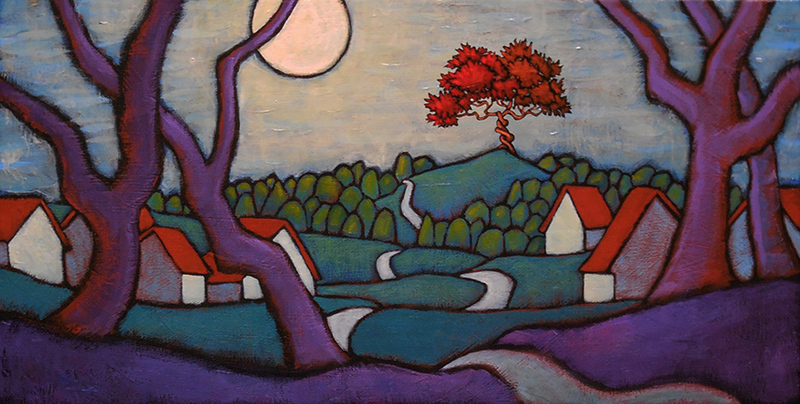 Some artists here are more stylized than others, but perhaps the most excellent example of stylization and its focus on line, form, and color here at the gallery is the work of GC Myers. 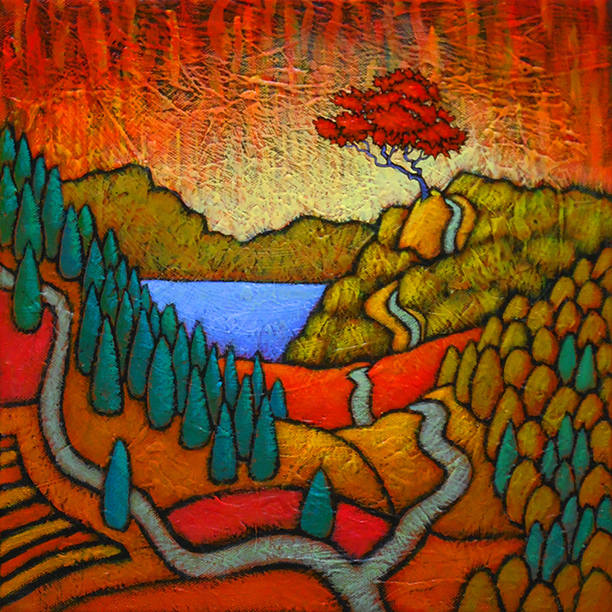 GC’s work goes beyond representation of landscapes and adds an emotive quality to the subject and forms, as they portray imagined vistas and use symbolism to create feelings and messages in the artworks. 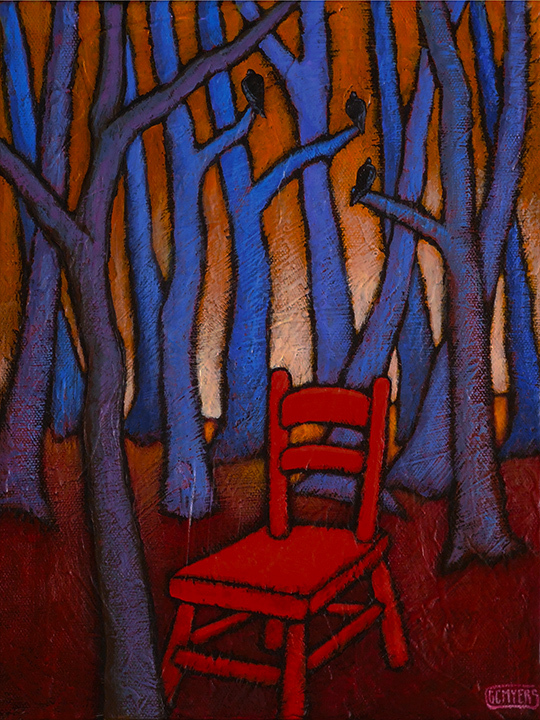 If you keep up with the artist’s blog, over at redtreetimes.com, you can often get a detailed insight right from the artist into the emotions and symbolism that infuse any given work of his, but the wonderful thing about his artwork is that it’s also something that can communicate on its own. Feelings of confusion, triumph, peace, frustration, joy, melancholy, and joy all make themselves known to the viewer purely through the interplay of lines, colors, and shapes in these landscapes. While these works come from a deeply personal place in the artist’s soul, one of the magical things about this art is that it also leaves so much space for interaction and interpretation from the viewer, independent of any verbal explanation from the artist. We are thrilled to be opening an exhibition titled “Truth and Belief” this Friday, June 2nd, which will feature 55 incredible brand new paintings from GC Myers. Here’s a sneak peek at some of the beauties from this show, and if you’d like to see all of them, head over to our website, shoot us an email at info@principlegallery.com, or better yet, join us to welcome the artist and celebrate the exhibition this Friday evening from 6:30-9 PM at Principle Gallery! Gearing up for the June exhibition! This post on GC Myers’s blog has us SO EXCITED for the upcoming show! Make sure you follow Principle Gallery on this blog and on social media to get sneak peeks of the new images!